Infrastructure gaps: India lags behind in recycling cell phones due to the absence of collection schemes and a full-scale recycling unit in the country. Photo by Andrew Sacks/Getty Images/AFP. Only 3% of people recycle their mobile phones despite the fact that most have old devices lying around at home that they no longer want, according to a published global consumer survey by Nokia Oyj. Three of every four people said that they don’t even think about recycling their devices and nearly half were unaware that it is even possible to do so. Globally, 74% of consumers said they don’t think about recycling their phones, despite the fact that around the same number, 72%, think recycling makes a difference to the environment. This was consistent across many different countries, with 88% of people in Indonesia not considering recycling unwanted devices, 84% in India, and 78% of people in Brazil, Sweden, Germany and Finland. Globally, half of those surveyed (this survey was based on interviews with 6,500 people in 13 countries including Finland, Germany, Italy, Russia, Sweden, the UK, the United Arab Emirates, the US, Nigeria, India, China, Indonesia and Brazil) didn’t know phones could be recycled, with awareness at the lowest level in India at 17% and Indonesia at 29%, and highest in the UK at 80% and 66% in Finland and Sweden. The survey revealed that one of the main reasons why so few people recycle their mobile phones is because they simply don’t know that it is possible to do so. In fact, up to 80% of any Nokia device is recyclable and materials within it can be reused to help make new products. Nokia started planning its take-back and recycling programme in India in 2008 with the objective of raising consumer awareness on recycling of mobile devices and making it easy for consumers to recycle by deploying a permanent collection infrastructure and tying up with responsible recyclers. A number of critical challenges were identified during this stage: firstly, recycling as a concept is not very well understood in India among the masses. The term often gets confused with reuse. There was a high level of scepticism and reluctance among trade partners, retailers, marketers and media partners on the business benefits of the environmental initiatives like these. Most of the e-waste in India is recycled by the informal sector whose processes cause serious environmental, health and safety hazards. And some of the solutions to the problem are that people will start recycling if they are provided the right information, and it is easy for them to recycle. Moreover, trade partners play the most crucial role in convincing the consumers and encouraging them to recycle. Indian consumers try to extract the maximum value out of each and every product and use it until it becomes of no use to them. This means that the product may be repaired several times during its lifetime. After the product is thoroughly used, consumers tend to extract further value out of the product by selling it to an informal waste collector (kabadiwala). These collectors buy all sorts of wastes such as newspapers, old metal junk, plastics, bottles, tin, old furniture from households on a regular basis. The electronic products generally have two-three owners during their entire lifetime; old electronics—especially ones that are still functioning or have the potential to function after some repair—are given away or sold to other people for a price. 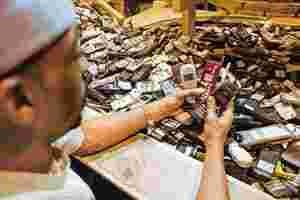 Old mobile phones, too, are used till no further value can be extracted out of them. They are then kept as back-ups, handed over to others or sold or exchanged for a discount on a new phone. Even dead phones are taken as a last resort by some places, where the shops can either repair them or buy them for extracting the working components. Many consumers hang on to their old phones for the sake of emotional attachment. These findings implied that any communication around the recycling of phones has to stress the aspect of recycling of so-called dead or totally useless phones rather than old phones. The consumers should be communicated that a dead phone is of no value to them and it should rather be recycled. A majority of the consumers do not clearly understand the concept of recycling. Recycling to most people means getting some value out of something that has become useless. Often, the understanding is around getting the same form out of the original item, such as use of old newspapers to create new paper. This finding implied that any communication around recycling needs to be very short and simple. They first need to understand recycling, and then understand recycling of mobile phones. The concept of recycling could be explained to them through an easy metaphor like a water cycle—something they can relate to from everyday life. The idea of extracting materials from phones during the process of recycling and then using these materials for making different products such as utensils and park benches needs to be explained clearly. This otherwise could lead consumers to think in the direction that Nokia is making new phones (for cheaper) out of the old phones it collects from consumers. This finding also implied that it is a challenge to get consumers to take a responsible and active role for actions leading to the larger welfare of society. The recycling campaign should entail a systematic and continual process of education that would awaken consumers and make them think on this issue. This finding also has an implication on the involvement with social causes where one does not gain anything for oneself immediately. It would be more motivational to offer some kind of an incentive to the recycling of phones—an emotional or social one that has some immediate gain. However, a financial incentive might defeat the larger objective of awakening the consumer to the concept of being environmentally aware. Pranshu Singhal is head, sustainability, at Nokia India Pvt. Ltd.